Hello! Welcome back to my little corner of the web. Its the middle of autumn and we’ve had all sorts of weather in the last month. Today, as I type we are in the middle of our second named storm (Callum) in just a couple of weeks. 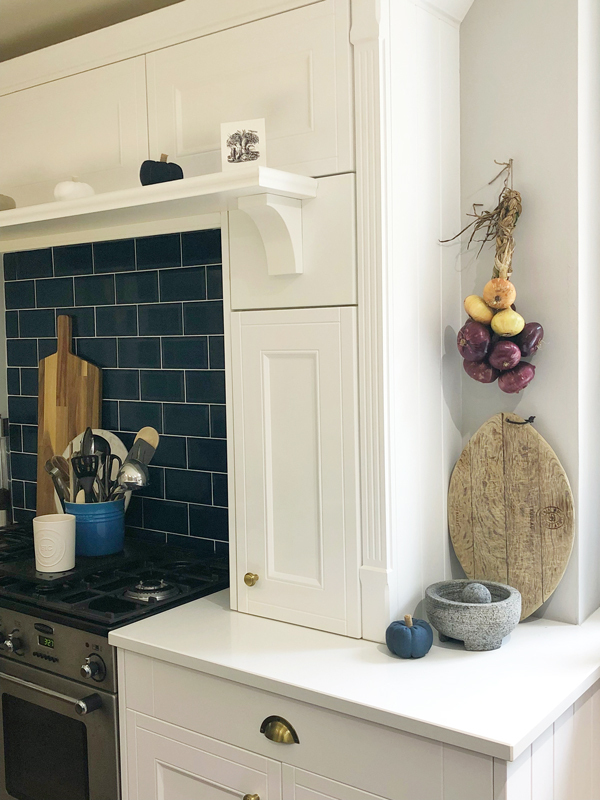 The wind is up, the sky is dark, and I am very thankful that our new wood burner stove has been fitted and is keeping cosiness levels at an all time high. 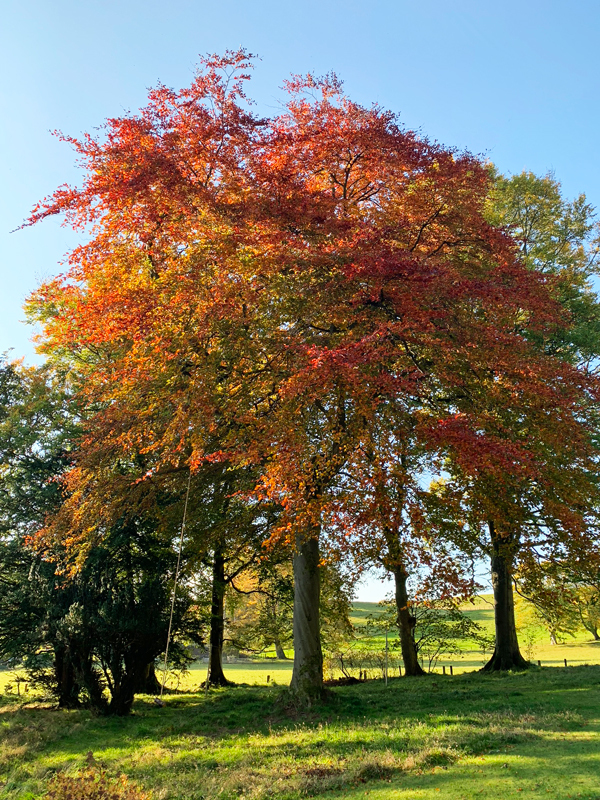 We’ve also been lucky enough to have some perfect autumnal days, fresh and sunny and even the odd anomaly of a balmy 18 degrees just this week. 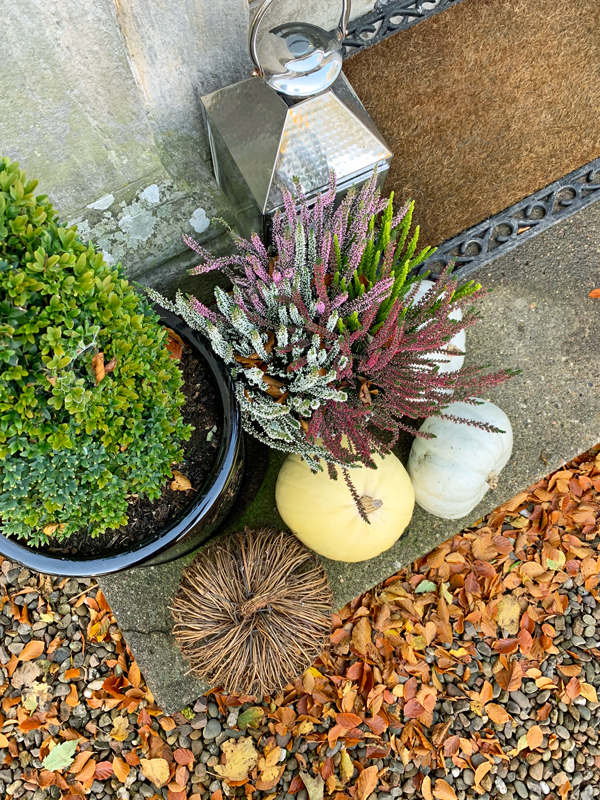 For the last few weeks, I’ve been focused on learning what can be planted in autumn, getting things planted whilst the ground is still warm, along with tidying and pruning the perennial borders. For now, lets start with the garlic. 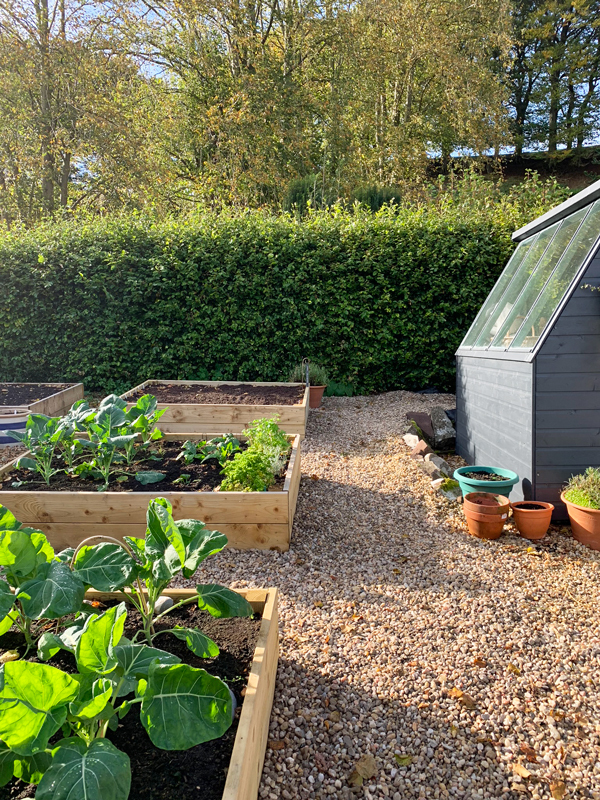 I ordered a new 6 x 4 raised bed from Quickcrop, making 6 beds in total in the kitchen garden. Andrew and I built it and placed it into position. I was going to use the recently harvested potato bed for the garlic, but decided against it for two reasons. 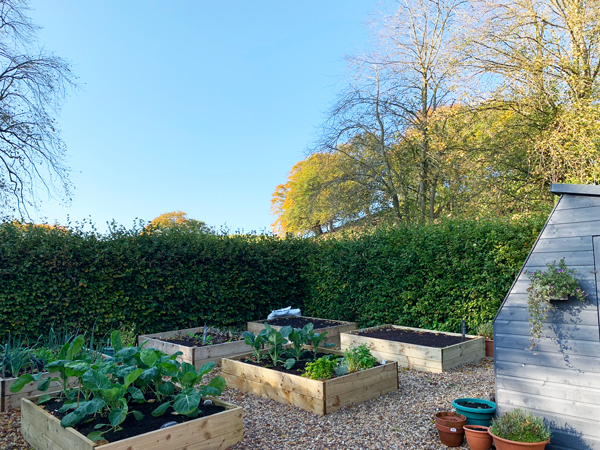 Garlic is best grown in full sun, and the new bed would be perfectly positioned to make the most of the winter sun. See photo on the right. 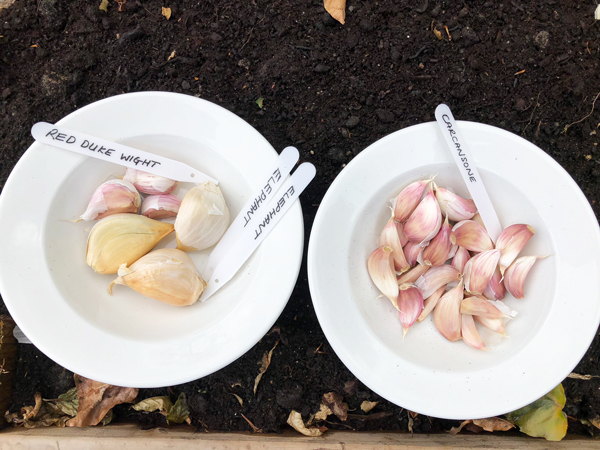 Secondly, I wanted to start my first crop of garlic in fresh soil that hasn’t been utilised this growing season already. 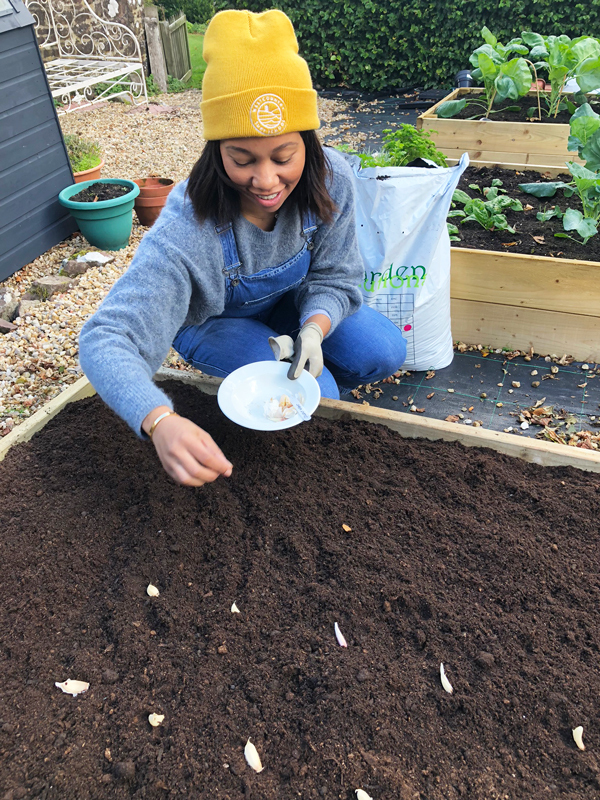 Garlic is in the ground for up to 8 months, and needs nutrient rich soil. I’ll get to grips with crop rotation next year! I found out about The Garlic Farm from a fellow instagrammer. They are based on the Isle of Wight and produce some of the best known varieties of seed garlic. I LOVE garlic and use it a lot in cooking, so decided to commit one and half beds to growing the crop. 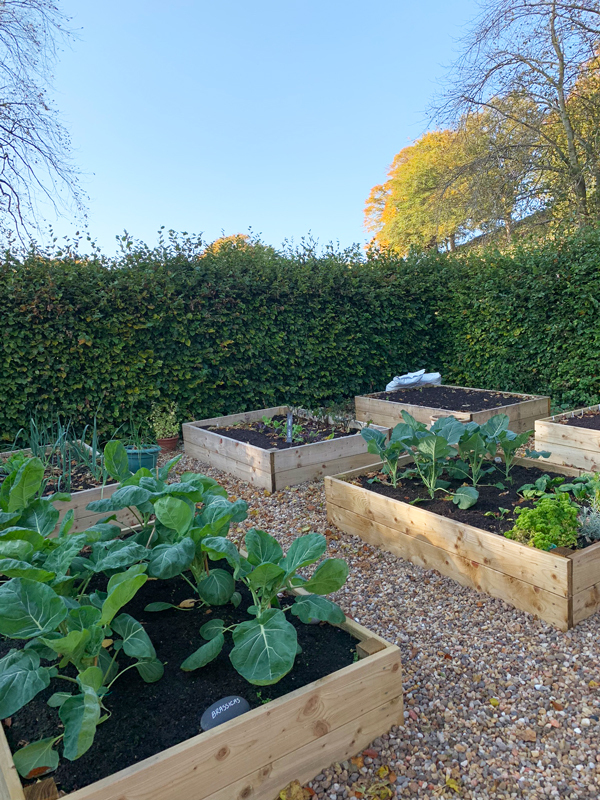 I’m growing one full 6 x 4 bed of soft neck varieties and half a bed of hard neck. Soft neck generally store for a longer period of time. Hard neck varieties provide you with garlic scapes, which are apparently really yummy in soups and stir fries. I’m seriously looking forward to harvest time to try them. The soil mix is the same as all the other beds. One third compost, one third well rotted manure and one third topsoil. 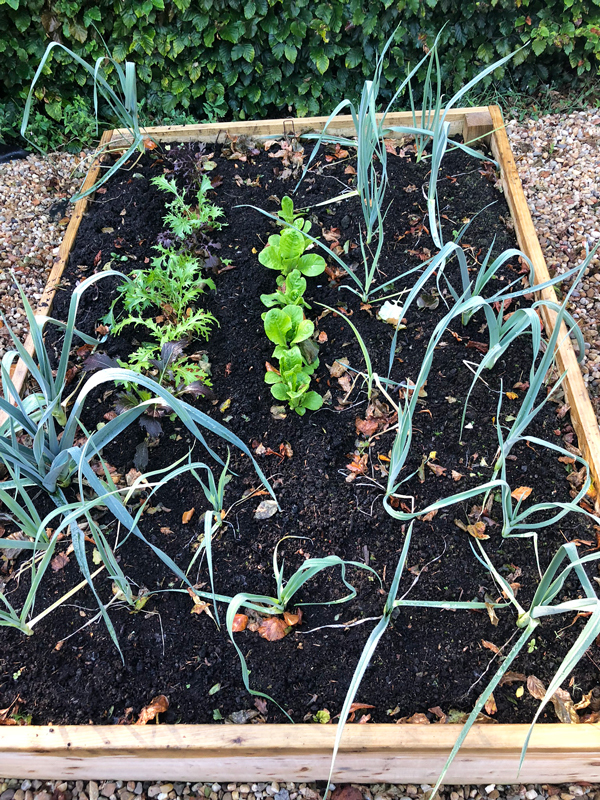 I planted the garlic roughly 10-15 cm apart and around 5-10 cm deep, except the elephant garlic which needed a bit more space. I won’t be mulching the bed over winter hence a slightly deeper planting depth. The below video is a 20 second clip of how I planted these up. 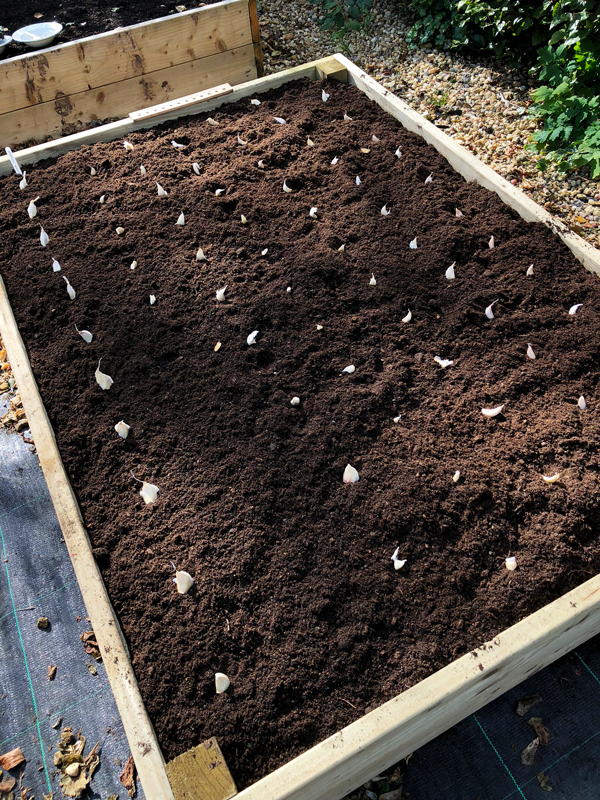 Because the soil was so light and fluffy, I didn’t bother digging a trench but instead just pushed the individual cloves into the ground pointy side up. I watered them in to remove any air pockets and will leave them untouched until spring. If the weather is dry I will water them, but this is Scotland so that’s highly unlikely! Come spring I will start a fertiliser routine and will cover that in a future post. Garlic is best sown in autumn but can be planted up to mid spring if you’ve missed the boat. 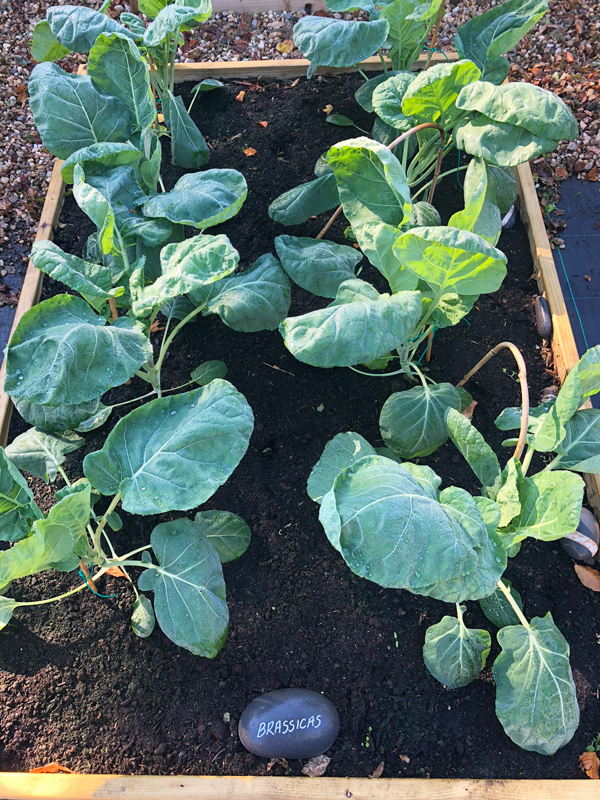 In other news, the Brussels sprouts are coming on well. Just this week tiny Brussels have started to form along the main trunks. I’m not entirely sure these will be ready for Christmas, as I was a little late in planting them, but they will be enjoyed nonetheless. Cabbage white butterflies, caterpillars and the like are no longer a threat to crops so I have popped the mesh netting away for the year. I thinned out the lettuce seedlings and planted the thinning’s into another bed along side the beetroot. The first sown leeks were ready for harvest a few weeks ago. I pull them up as I need them. They are delicious, and have been forming the base for soups and sauces. The now empty potato bed in the corner will be left to lie fallow over the winter months. I will top it with well rotted manure and possibly some mulch, but I’m in two minds about covering beds with a weed membrane or cardboard. I’ve read that a lot of gardeners do this, but I’m not convinced its completely necessary. What would you do? 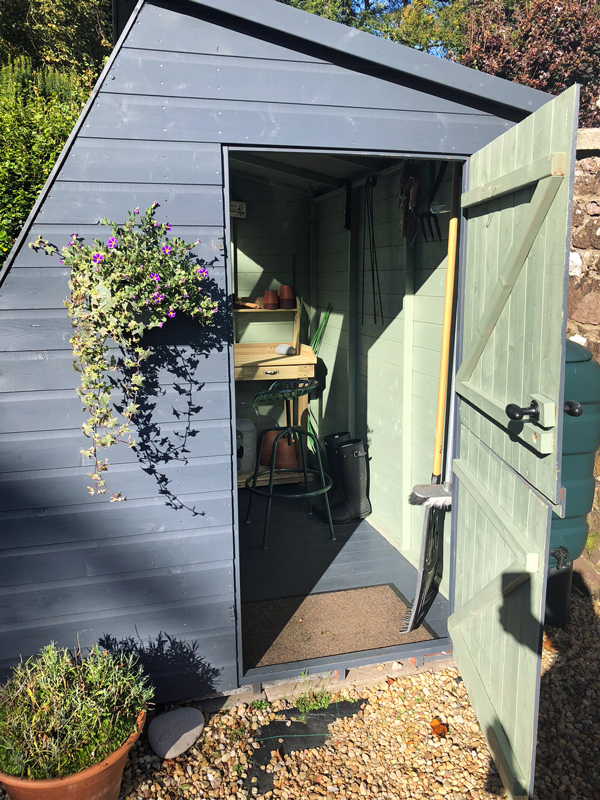 …I come up here most days to sit with a cup of tea and imagine the garden next year now all the foundations have been laid. …Well half of them anyway, the rest have been used. I must say this was probably one of the most rewarding moments of the gardening year for me. 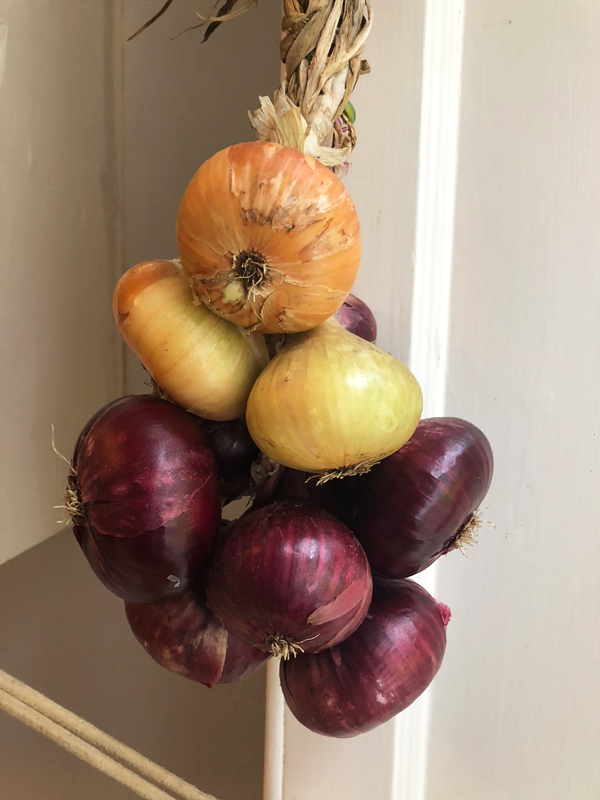 There is nothing more satisfying than snipping an onion off to use in a meal. This yellow beauty was supposed to be the famous Cafe au Lait variety. 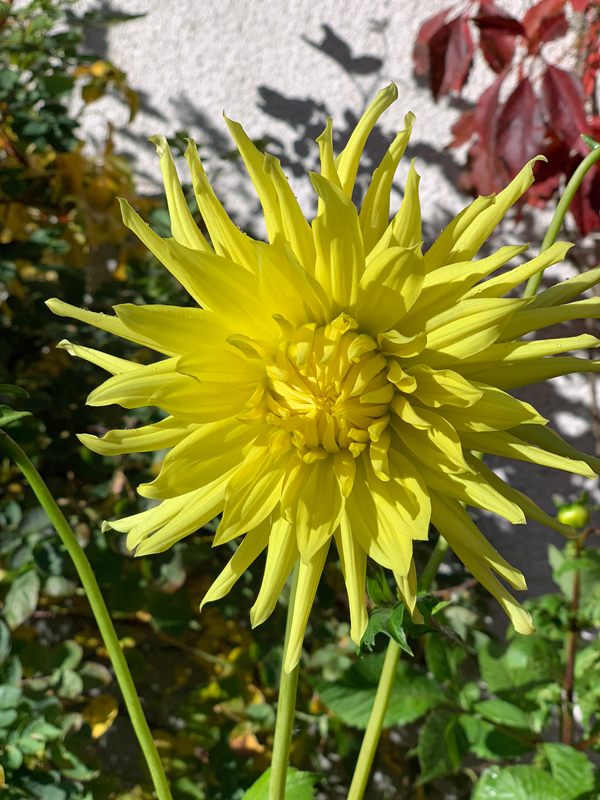 I think its actually a Yellow Star or Happiness Dahlia. I got in contact with Sarah Raven who was only to happy to fix the mistake and send me new tubers for free next year! The pathways have been topped up with gravel, and Andrew and I are currently working on a new DIY project to finish off the pathways, so stay tuned for that. We finally invested in a leaf blower! We put it off last year as we needed a fairly industrial machine to keep up with the millions of leaves that drop each autumn and it was rather pricey. Anyway, Andrew found just the ticket a couple of weeks ago from the brand Stihl and life is suddenly that bit easier! 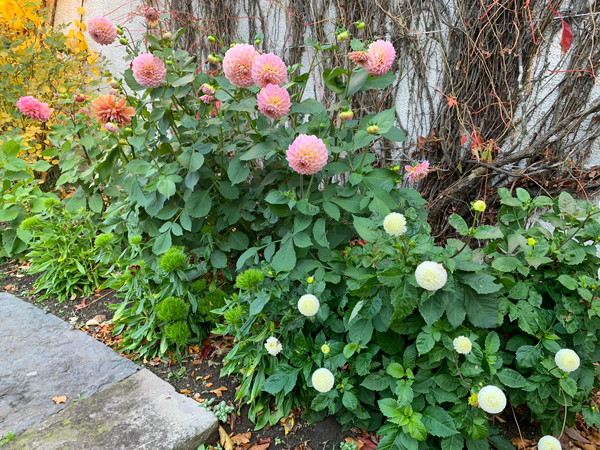 The Chrysanthemums I put out in August were replaced with heather. I found a lot of gardening websites advise the ‘mums’ will flower again after deadheading but mine didn’t at all, so they had to go! 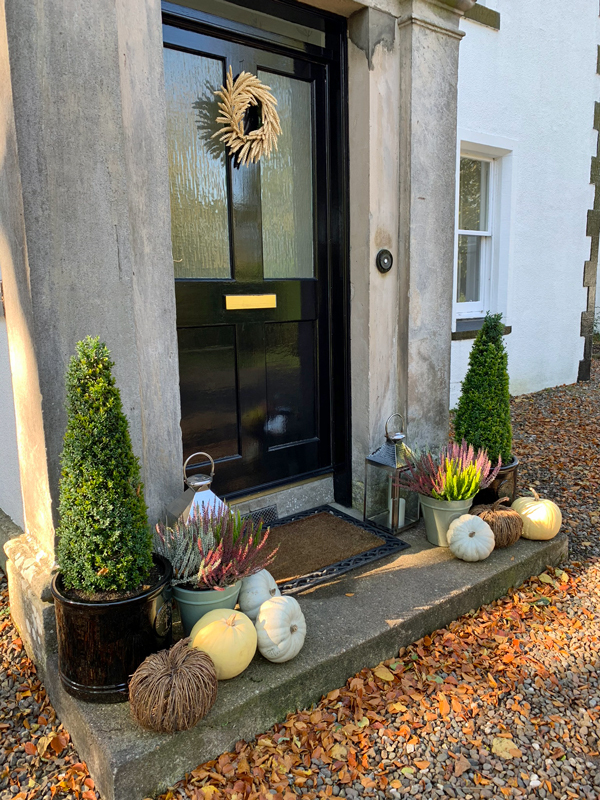 Lastly, a snap of my front door decorated for the season. The wicker pumpkins are from Waitrose and the real ones are from Craigies Farm. 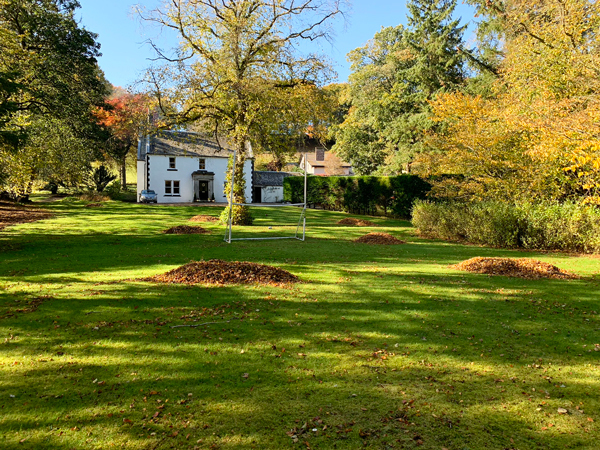 There will be a second part to this post in the coming weeks, covering the hundreds of spring bulbs ordered, where they will be planted and more. What a nice way to start my morning! A cup of tea while reading your post! I love living vicariously through your pictures which are beautiful! I don’t have room for vegetables but I love seeing what other people do to grow them. 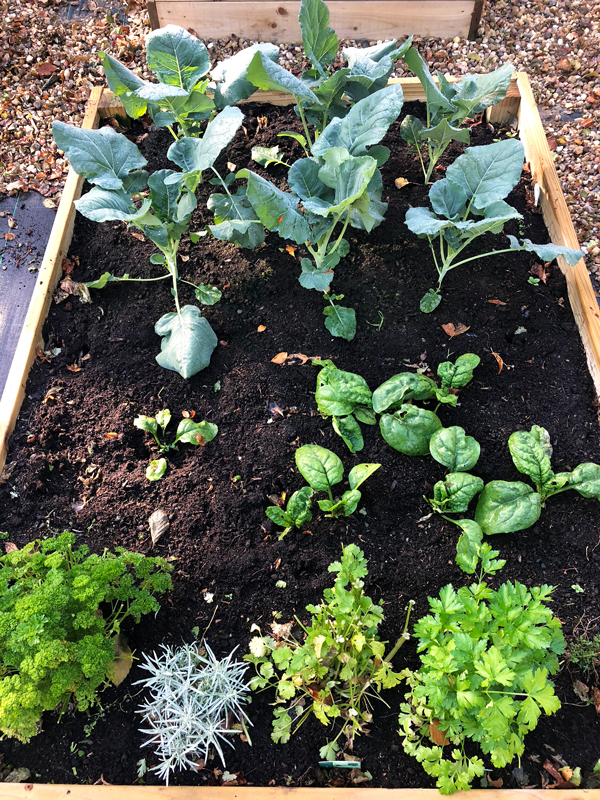 Your garden is looking amazing, you should be so proud of yourself! Happy Sunday, enjoy your day!